Welcome to Ventana al Mar “Window to the Sea,” A Sayulita luxury vacation rental. 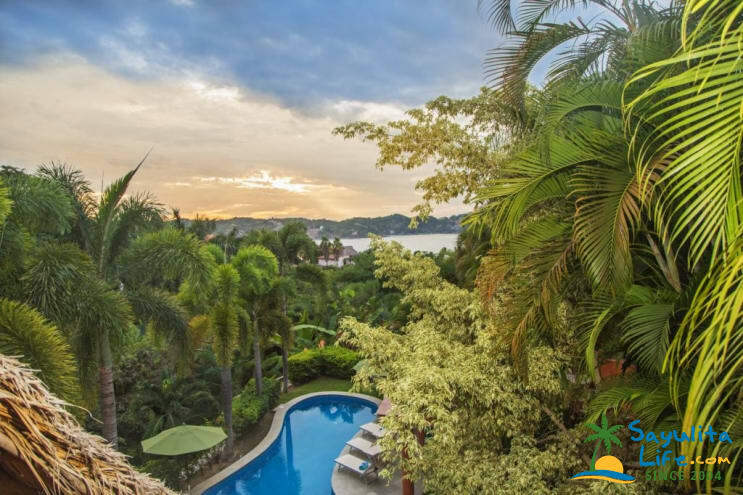 Ventana al Mar in Sayulita is an architecturally designed home offering 4 beautiful bedrooms and 5 bathrooms. Decorated in a relaxed tropical style, beautiful colors, local art, iron work and artistic tile run throughout the house. Each of the bedrooms offers our guests privacy with its own bathroom and terrace as well as ceiling fans, air conditioning and screened windows for your sleeping comfort. The large open living room under a soaring 30 foot palapa is the perfect place to relax with family and friends, have a movie night, play games or simply watch the sunset over the blue pacific. The kitchen and dining areas are outfitted with everything you will need to make delicious meals. In addition the entire house has a water purification system. Enjoy a leisurely dinner seated at the beautiful handcrafted copper dining table. Not in the mood to cook, let us arrange for a local personal cook, for beautiful Mexican meals and the ultimate vacation! 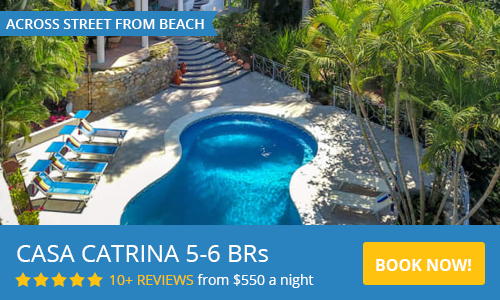 Ventana al Mar boasts one of Sayulita's state of the art salt water pools. The private tropical grounds surrounding the pool area are filled with palms, red ginger, bananas, bougainvillea and heliconia. There is a shady poolside palapa, built in gas barbeque, sink, refrigerator and shower. The perfect spot to blend up some margaritas and grill some of the local catch of the day. Or just lounge poolside with one of the many books the house has to offer. 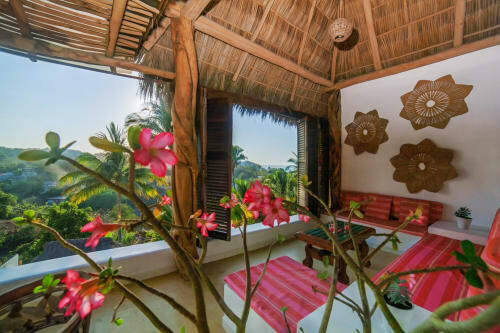 Ventana al Mar is located on the quiet and tranquil north end of Sayulita. A 3 minute walk down a cobblestone path takes you to the beach and a 10-15 minute walk takes you to town. Depending on your individual needs there are numerous car rental agencies available (we use Gecko) or we can arrange for roundtrip airport pick up along with a grocery stop. Children are welcome at Ventana al Mar, however please be aware that like many Villas in Sayulita there are low balconies, therefore toddlers and small children would require special attention. Fully equipped kitchen, basic spices and staples included. Our manager, Arely, is a great cook and can arrange meals for your group on a per-person cost basis. Ask to see her menu upon arrival. My family and I stayed at Ventana al Mar for a week. There are 10 of us ranging from 5 to 60 years old. We all had a fabulous time. The house was perfect for 4 families and everyone had their own private space with a view.. if we were not in town we spent most of our time out by the pool, in the living area and kitchen. There was nothing you would want that is not at this house. It is vey well appointed, extremely clean thanks to Maria who is a beautiful person. The grounds are stunning and you hardly ever see the Gardner Pancho but he is there kepping things beautiful. Sayulita is a great place to vacation and this house is perfect. I look forward to a time my family and I or friends can stay again. Beautiful home - better than the photos! We had 4 couples who rented this house and we couldn’t of beeen more comfortable. The house is beautiful and was very clean. Each room had a very cool indoor/outdoor shower. We all had our own space and we’re comfortable - especially the beds! The ladies that work at the house while you are there were very nice, helpful and trustworthy. I highly recommend ventana al mar. Couldn’t of been happier with our choice. Loved the place, views were unbelievable, and the service...first class. While the pricing was quite high (we came during New Years), we thought the experience was awesome. Really appreciate the team's efforts making our stay unforgettable! Stayed here for the second time in March 2018. We love, love, love this house! The open air living room, dining room, kitchen makes you feel like you are living in a tropical paradise. The views from the living room over the pool are picture post card perfect. Beauiful art everywhere. All the bedrooms have comfy beds and spacious bathrooms. The pool area has a wonderful BBQ and fridge so you can grill and enjoy the privacy of your own pool. Bedrooms allow you to have some "alone time," and are air conditioned if you need it. We love sleeping with windows open though. The staff is friendly and helpful. The owner is wonderful to deal with. I would not hesitate to recommend this house. My kind of place, I don't ever wanna leave! Had the pleasure of staying at this amazing, resort style, open air home with some family, friends and kiddos. Ventana al Mar is such a beautiful spot, it was hard to leave at times. The housing staff was amazing and went above and beyond what we would consider the necessary duties day in and day out. Always with a smile on their face. Sitting by the pool or in the pool on one of the many floats offered was what vacation should be! There was also plenty of entertainment with tons of DVD's and games for the kids. Thank you for sharing your beautiful home as our stay in this house was one of the highlights of the trip! Our stay at Ventana Al Mar was just amazing. The pictures are beautiful, but the allure of this place in person, is on another level. The traditional Mexican style architecture satiated my desire for a truly authentic Sayulita experience. Separate quarters allowed our big family private retreats, but at the same time the open kitchen, dining room and living area were great to socialize with the entire family. All of these included spectacular views and cozy atmospheres. Before my trip was over I was making plans to return. This was a beautiful location for sure. The spaciousness of the house, the amenities, the pool (which I got in 15 minutes after arrival, awesome!). It felt a million miles away. We had other house mates and we staying in the casita. Just the best experience. Would go back in a minute! What a great week! I could stay forever! This property is just incredible. Beautifully appointed furnishings, open air feel, and the layout allows each room to have extreme privacy. The kitchen contains all of the equipment necessary for cooking even the fanciest of meals. The house staff is efficient and expert. We visited several other properties during our group stay and this house was the best one! Sunsets from this house are beyond phenomenal!!! Ventana al Mar was without a doubt, one of the most special homes I've ever vacationed in. It was truly perfect. From the moment we walked in the door...we were trying to mastermind a way to extend our time spent there. The town of Sayulita is equally as wonderful...every day we were torn deciding on whether to spend the day exploring the area or to have more pool and patio time! Ventana al Mar was perfect! 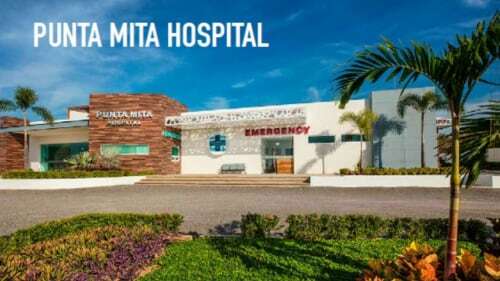 Our family of six adults with four kids found Ventana al Mar to meet our needs perfectly. This beautiful home and its private, lushly-landscaped grounds exceeded our expectations. The pool was a big, big hit with everyone, especially the kids. The staff - Arely, Maria and Pancho- were exceptionally friendly and accommodating. Arely prepared a wonderful meal for us to enjoy on our first night there. We also decided to cook in on three other nights, as the grill and kitchen are well-equipped with all necessary pots, pans, utensils, bags of ice, toasters, etc. We highly recommend renting a golf cart to get around quickly and easily, as the downtown is a 20 minute walk minimum, and the house has a pretty steep climb up the road to get to it. We rented two carts (for 6 adults/4 kids) and used them several times each day to shop, to buy fresh fish/ fruit/vegetables/booze at the local markets, to drive to a less crowded beach, and simply to enjoy the downtown's lively sights/sounds/culture/food and especially, the local residents. We are well-traveled adventurers internationally, and Ventana al Mar gets our highest recommendation. Go for it! $500.00 security deposit Refunded in full after departure less any damages to the property. 50% of the total rent due to secure reservation Balance due 45 days prior to arrival along with security deposit.